Preheat to 375 degrees. Line two large baking sheets with parchment paper. Place nuts in food processor and process until medium fine in texture. Beat the butter and sugar together with an electric mixer until light and creamy in texture. Add in the vanilla and beat until combined. In a separate bowl, combine flour, nuts, baking powder, salt, cinnamon and lemon zest. Add the flour mixture to the butter mixture and beat to combine. Place in freezer until firm, approximately 30-40 minutes. Alternately, refrigerate for about 60 minutes. Dust a clean surface generously with flour and roll out the dough to approximately 1/8 inch thickness. 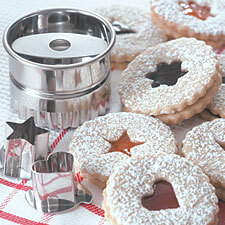 Using the linzer cutter without an insert, cut out cookies (at least 36) and transfer to the prepared cookie sheets. These will be the bottom pieces. Next cut out 36 more with the insert shape in cookie cutters. These will be the top pieces. Either reroll or bake the inserts. Bake all cookies for about 8 minutes until golden brown. Trasnfer to a wire rack until completely cooled. Sift confectioners sugar over top pieces of the cookies. Spread about 1 tsp. jam on each of the bottom halves and place top half (the cut out cookie) on jam covered bottom half. 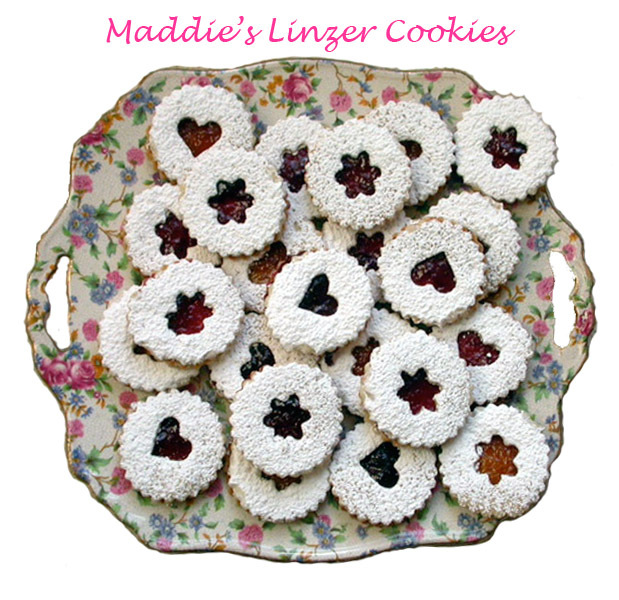 Linzer Cookies can be stored carefully in an airtight container for up to one week. Place the berries and granulated sugar in a heavy bottomed pot, and bring to a boil, stirring to incorporate the sugar. Simmer for 5 to 10 minutes. Add the lemon juice and cook for another 5 minutes to thicken. The liquid should coat the back of a spoon. Strain through a fine mesh sieve into a bowl. Refrigerate until set. Note: it’s fine if it’s not as thick as regular jam, but it should be able to puddle without running. Lovely linzers! Who knew it could be this easy to make gorgeous filled cookies? Beat together the butter, sugars, baking powder, salt, cinnamon and flavor. Mix in the nut flour, flour, and egg. Divide dough in half and wrap well. Refrigerate for 60 minutes, for easiest rolling. Roll the dough 1/8-inch thick. 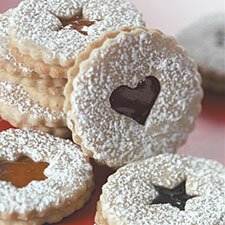 Cut half the dough into shapes with a solid linzer cutter. Cut the other half of the dough with a cutter that has a design cut into the center. Transfer the cookies to an ungreased or parchment-lined baking sheet. Bake in a preheated 375°F oven for 8 to 10 minutes, until lightly browned on the edges. Cool on a rack. Dust the cookies with cutout tops lightly with confectioners’ sugar. Spread the solid cookies with 1/2 teaspoon of praline filling or jam. Place a cutout cookie on top. Let stand for several hours, until the filling is set. Yield: about 5 dozen filled cookies. Melt the praline paste and chocolate together in a double boiler or in a microwave on low power, stirring until smooth. Cool to lukewarm before spreading on cookies.